Tlingit Indian from Kake, Alaska. Tsaagweidi clan, Xaay Hit (Yellow Cedar House). My Tlingit name is Xaashuch'eet. I am primarily a designer. Though I've always loved cedar and have been a woodcarver for many years, I find much freedom in design. I paint in acrylics and work in mixed media. I explore ways to represent contempory issues by using themes of re-creation and transformation. In using non-traditional materials and styles I bridge our tribal past to the present. Northwest Coast art is the term commonly applied to a style of art created primarily by artists from Tlingit, Haida, Heiltsuk, Tsimshian, Kwakwaka'wakw, Nuu-chah-nulth and other First Nations and Native American tribes of the Northwest Coast of North America, from pre-European-contact times up to the present. Northwest Coast art is distinguished by the use of formlines, and the use of characteristic shapes referred to as ovoids, U forms and S forms. Before European contact, the most common media were wood (often Western red cedar), stone, and copper; since European contact, paper, canvas, glass, and precious metals have also been used. 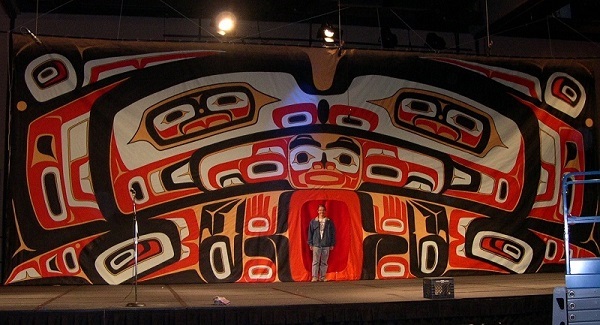 If paint is used, the most common colours are red and black, but yellow is also often used, particularly among Kwakwaka'wakw artists. Chilkat weaving applies formline designs to textiles. Tlingit, Haida, and Tsimshian have traditionally produced Chilkat woven regalia, from wool and yellow cedar bark, that is important for civic and ceremonial events, including potlatches. The patterns depicted include natural forms such as bears, ravens, eagles, orcas, and humans; legendary creatures such as thunderbirds and sisiutls; and abstract forms made up of the characteristic Northwest Coast shapes. Totem poles are the most well-known artifacts produced using this style. Northwest Coast artists are also notable for producing characteristic "bent-corner" or "bentwood" boxes, masks, and canoes. Northwest Coast designs were also used to decorate traditional First Nations household items such as spoons, ladles, baskets, hats, and paddles; since European contact, the Northwest Coast art style has increasingly been used in gallery-oriented forms such as paintings, prints and sculptures. Wikipedia contributors. "Northwest Coast art." Wikipedia, The Free Encyclopedia. Wikipedia, The Free Encyclopedia, 16 Jan. 2015. Web. 16 Jan. 2015.